My family immigrated to the United States when I was 5 years old. My father applied for and obtained a green card relatively easily as an educated professional. 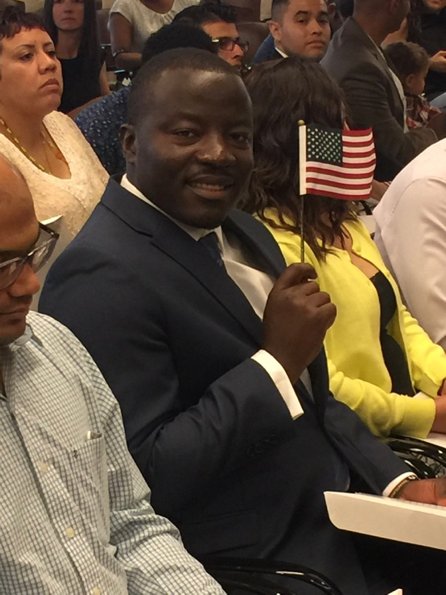 Without any hiccups, my parents became US citizens a few years later and I followed thereafter becoming a US citizen on September 16, 1988. I remember with pride obtaining my citizenship, but I was not as appreciative of the benefits I would be afforded. My family is from Canada. Twenty-four years later, my then fiancé applied for a fiancé visa to the United States. We filled out countless documents detailing his education, medical exam, financial and bank information and evidence of our relationship together including emails, travel, and the birth of our daughter. He was granted a visa and we moved from Kenya to the US in the fall of 2012. Carefully following immigration procedures, we completed in-person interviews, submitted ongoing paperwork and documentation of our life together, allowing him to obtain permanent residency (a “green” card). At the same time, he obtained an MBA from the University of Denver and found stable employment. Eventually, he was able to apply for citizenship. He studied seriously for his citizenship test- 100 questions I would not have been able to answer half of and passed with flying colors. The whole family attended his swearing in ceremony with pride. His citizenship meant so much. Visa-free travel around the world, employment opportunities, and above all, the confidence that we could remain as a family indefinitely in the United States. Things I never once worried about with or without my US citizenship. My husband is from Kenya. Recent immigration rhetoric has turned ugly in many ways. When we don’t know individual immigrants, we tend to lump people into whole groups that don’t represent who they are or where they come from. Our immigration history shows that as a country we go through waves of targeted anti-immigrant fervor- sometimes targets Catholics or Jewish people, other times Chinese, non-white, and Latinos. At certain times it was incredibly hard to immigrate if you were Irish, Polish, or Italian- hard to imagine today. While it is true that many immigrants come to the US seeking a better life, clearly many are not impoverished, uneducated, violent, or hold extremist views. African immigrants, who were recently characterized as coming from “shithole” countries for example, have generally higher education rates than the US population as a whole with 43% holding bachelor’s degrees or higher versus 29% of U.S. citizens, and 70% already speak English on arrival. But statistics only mean so much. What about the actual people? The majority of Kenyans we know in the U.S. came initially for educational opportunities not available in Kenya. They chose to stay because job options for them in Kenya aren’t comparable to here. My children are incredibly lucky. Not just because they were born in the U.S. and have U.S. citizenship but because they are also able to be dual citizens of Kenya. Kenya is an amazing country, with incredible people who we are proud and blessed to be a part of. If you’re uncertain about immigration- get to know an immigrant, learn about your family’s own immigration story and challenges. You may be surprised how alike our stories are.